This is an Icelandic name. The last name is patronymic, not a family name; this person is referred to by the given name Jón. Jónas Hallgrímsson was an Icelandic poet, author and naturalist. He was one of the founders of the Icelandic journal Fjölnir, which was first published in Copenhagen in 1835. The magazine was used by Jónas and his fellow Fjölnismenn to promote Icelandic nationalism, in the hope of giving impetus to the Icelandic Independence Movement. Jónas remains one of Iceland's most beloved poets, penning some of the best-known Icelandic poems about Iceland and its people. Since 1996, Jónas's birthday has been officially recognised in Iceland as the Day of the Icelandic Language. On 16 November each year, the Jónas Hallgrímsson Award is awarded to an individual for his or her outstanding contribution to the Icelandic Language. Geir Hilmar Haarde is an Icelandic politician, who served as Prime Minister of Iceland from 15 June 2006 to 1 February 2009 and as President of the Nordic Council in 1995. Haarde was Chairman of the Icelandic Independence Party from 2005 to 2009. Since 23 February 2015 he has served as the Ambassador of Iceland to the United States and several Latin American countries. Jón Helgason was an Icelandic philologist and poet. He was head of the Danish Árni Magnússon Institute for Icelandic Studies from 1927 to 1972 and professor of Icelandic studies at the University of Copenhagen from 1929 to 1969. He made significant contributions to his field. As a poet he was not prolific but noted for his highly polished and effective traditional poetry. His best-known poems are Áfangar and Í Árnasafni. Jón is an Old Norse common name still widely used in Iceland and the Faroes. 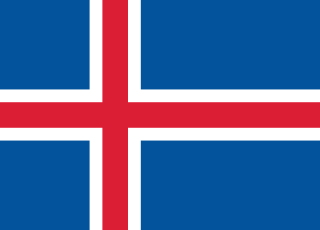 According to Icelandic custom, people named Jón are generally referred to by first and middle names and those without a middle name are referred to with both first name and patronym disambiguation is required. The Icelandic Ministry of Fisheries and Agriculture is a cabinet-level ministry. It is an important economic ministry, with fisheries products making up about 40% of Iceland's exports. Vínarterta, also known as Randalín, is a multi-layered cake made from alternating layers of almond and / or cardamom-flavoured biscuit and plum jam, the jam usually including spices such as cinnamon, vanilla, cloves and cardamom. Other fillings such as apricot and rhubarb are less well known, but traditional going back to the 19th century. Vinarterta originated in Iceland, but its name and composition both hint at Austrian roots. The recipe was brought to Manitoba by Icelandic immigrants to Canada, many of whom settled at New Iceland. The following lists events that happened in 1992 in Iceland. The following lists events that happened in 1959 in Iceland. The following lists events that happened in 1935 in Iceland. The following lists events that happened in 1931 in Iceland. The following lists events that happened in 1924 in Iceland. Cannabis in Iceland is illegal. Offenses such as sale and cultivation are heavily punished and can result in jail time. Possession of small amounts will not result in jail time, but offenders will still be subject to arrest and payment of a fine. 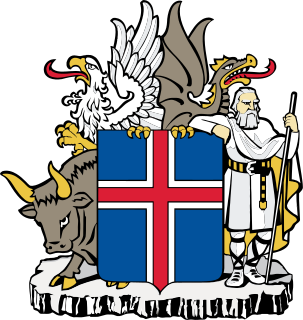 The Grindavík men's basketball team, commonly known as Grindavík or UMFG for short, is the men's team of the basketball department of Ungmennafélag Grindavíkur multi-sport club, based in the town of Grindavík in Iceland. It has won three national championships, in 1993, 2012 and 2013. Agnete Loth was an editor and translator of Old Norse-Icelandic texts. She is notable for editing late medieval romance sagas, which she published in five volumes intended "to provide a long-need provisional basis for the study" of these sagas. ↑ Dagný Hulda Erlendsdóttir (5 April 2019). "Jón Helgason er látinn". RÚV (in Icelandic). Retrieved 5 April 2019. ↑ "Andlát: Jón Helgason". Morgunblaðið (in Icelandic). 4 April 2019. Retrieved 5 April 2019. This biographical article about an Icelandic politician is a stub. You can help Wikipedia by expanding it.